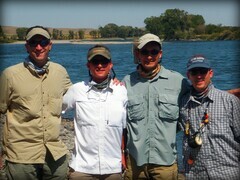 We started our Yellowstone trip this year with none other than the world class waters of the Yellowstone River. Everyone who passes through this area you're almost obligated to spend a few days on the glorious waters in Paradise Valley. My pal Rob is lucky enough to live in Bozeman and Denver and now San Francisco throughout the year, lucky Dawg. It's been a few years since I had floated the Yellowstone so he put on the guides and waters to target Cutthroats on dries. 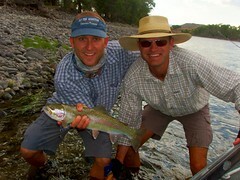 Montana to me is what Fly Fishing is all about. 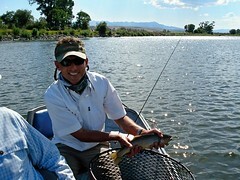 There is no other place in the lower 48 that I feel is better known for its superb fly fishing than Montana. 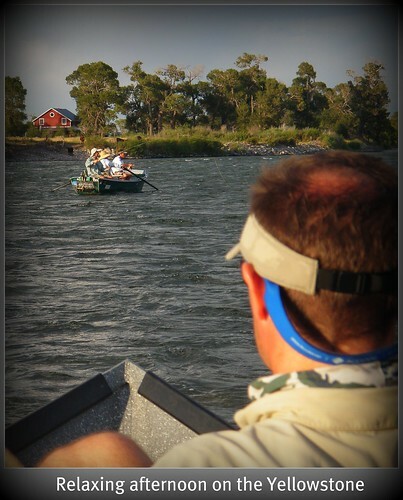 Sure Colorado has our share of top notch fisheries -as well as the crowds not to mention, but its Montana that reigns supreme to me for it's vast amounts of quality rivers, spring creeks, wide open valleys to float through and endless possibilities when it comes to rivers to fish. I mean for some of the guys it was a bit overwhelming trying to decide between the Yellowstone, Madison, Gallatin, Jefferson, Big Hole, Rock Creek, Blackfoot, Flathead, Clark Fork, Boulder, Missouri and let's not forget their quality trout lakes that grow some monsters. The Playas representing! Dave sporting a nice tan already, TDawg, Cobos and Donny B all for a great day out floating. Despite a late start we managed to still make it out in time and timed it pretty good for some Hopper action. Big Hoppers, Crickets and Club sandwiches were the name of the game today! No me the Streamer guy I had to try my luck but it just wasn't happening below the surface today, no complaints at all. Fish on seemed to be the phrase for much of the day, though we had some dry spells and I had waaaay too many misses (can you say about 20) so my game was not spot on but nonetheless I landed my share. My biggest was a whopper that looked around 4-6lbs that just barrel rolled my dry and snapped 4x like it was nothing, wow was that a beast! Our guide Sean Blaine was the man, a great guide that you couldn't have asked for more. Best of all he worked his tail off trying to get us into nice fish and he's even a Carp junky like myself having guided Brad Befus "the official Carpmaster" a few weeks back he said. Cobos with the nicest fish of the day and trip! 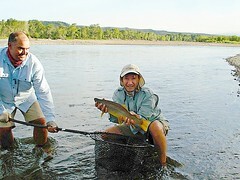 A healthy brownie that we all aspired to go after; he was just better skilled at landing it. Our guides said that they may get 1 every few weeks like that so Brian was more than happy at the end of the day with that bruiser. Their guide actually asked to have his picture with Brian's fish -just him? Never heard of someone doing that prefer..interesting. Dave with a nice fish and he had a good day as well despite having a guide that wouldn't let them stand up, wouldn't change flies much or row at all. Next time we'll get you a better one for sure. 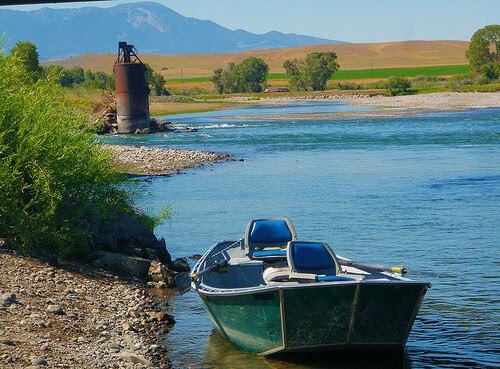 The Yellowstone River is in Southwest Montana and originates of course in Yellowstone National Park. 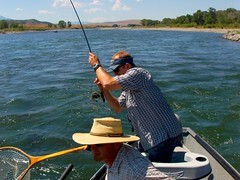 Because the Yellowstone River stretches such a big portion of Montana's landscape fly fishermen never really struggle with catching trout, but rather where they will begin and which trout they will count towards their limit. 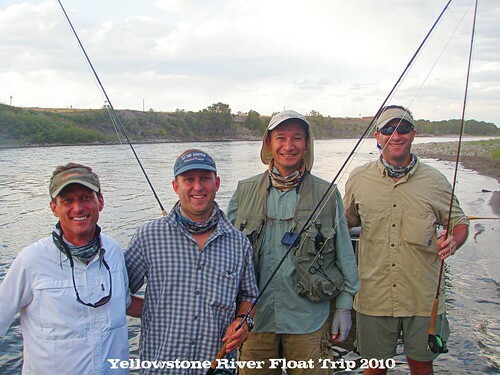 Add in the unbelievably beautiful scenery that surrounds the Yellowstone River and it is a true can't miss combination.